You don’t really need a special garden to attract butterflies. If there are plants in your garden that appeal to them, butterflies will find them. A true butterfly garden should not just be designed to attract adult butterflies, but also to afford a place for them to hibernate and lay eggs and for the larva, or caterpillars, to feed. Different species of butterflies have different preferences in plants. Many of the plants preferred by butterflies, like milkweed, dogbane, nettles , and thistles, are considered weeds by humans and often don’t make it into a butterfly garden. But a wide variety of plants should attract at least a few visitors. Understanding the Life of a Butterfly: Butterflies start life as eggs laid on plants. These eggs hatch into very tiny caterpillars, or larva, which start eating immediately. First, they eat their ​eggshell and then they begin feeding on their host plant. Unlike adult butterflies which feed on nectar, caterpillars prefer the leaves of plants. At this stage, the butterfly is capable of defoliating your butterfly garden. The caterpillars must molt, or crawl out of their skins several times before changing into a chrysalis, their pupa stage. An adult butterfly emerges from the pupa and flies off in search of food and host plants for laying its own eggs. This type of development is known as complete metamorphosis. Selecting Plants: Adult butterflies feed on flower nectar. 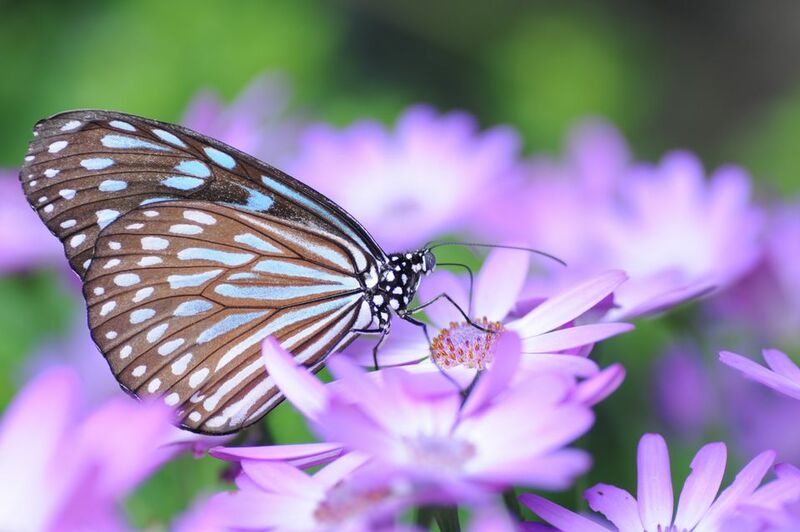 Some favorite butterfly nectar plants include asters, azalea, bee balm, blueberry, butterfly bush, butterfly weed, coneflower, goldenrod, Impatiens, Joe-Pye weed, lilac, marigolds, verbena and yarrow. Bright colors seem to attract more butterflies, but more importantly, large swaths of color will make it easier for them to find your garden. Use insecticides sparingly if you hope to attract butterflies. Find out how to make butterflies feel more at home in your garden. Climate: Butterflies usually make their appearance in the spring, once the temperature is above 60o F, and stick around through the fall. They fly best when their body temperature is between 85-100o F. If the temperature dips below 80o F you will see butterflies basking in the sun with their wings outstretched, absorbing heat. A flat rock is often included in butterfly gardens for this purpose. Shelter: Butterflies require a sheltered location to rest and to seek protection from bad weather. During the night they roost, often on the underside of a leaf. Shrubs and tall grasses are also useful as shelter and windbreaks. Puddles: Sometimes you will see a crowd of butterflies around a puddle. This is known as puddling and it is thought that butterflies are attracted to puddles because they contain dissolved minerals which butterflies need to supplement their diet. Shallow bird baths or even placing a shallow dish of water in your garden can be attractive to butterflies. Hibernation: Except for the migratory Monarch butterfly, most hibernate in the same place they spend the summer. They look for places such as loose bark, log piles or even buildings. Some overwinter as adults, others as pupa and some as caterpillars. Many people like to place a butterfly hibernating box in their butterfly gardens. Often these boxes are referred to as butterfly houses, but they are actually meant as shelters in which certain butterfly species will overwinter. Or will they? Entomologists don’t have many encouraging words for hibernating boxes. There are simply too many other places for butterflies to choose, most more natural looking than a man-made hibernating box. However, it is not unheard of for the occasional butterfly to move in. Don’t look for occupants in the summer months. These are hibernating boxes, not homes or shelters. To have your best chance of attracting an occupant to your box, situate it in the woodiest section of your garden. If you can mange to site it near a host plant, you increase your chances even further. If you don’t have host plants nearby, a late fall nectar source, like sedum or asters, is also good. As for the height and color of the box, most butterflies are not that discerning. They will hibernate under logs, in tall grasses or even the eaves of your house. Since you bought your box to be attractive as well as to be obliging to butterflies, place the box to please you and then enjoy the butterfly activity knowing you tried your best to be accommodating. See what plants and shrubs you can put in your garden to begin attracting butterflies.